Good Stinks specializes in flameless candles, tarts (melts), tart warmers and candle warmers. If you’re worried about flames but love scented candles, this is a nice alternative. Their pillars are actually real wax shells with battery operated tea lights inside. Many of Good Stinks fragrances are food based and they sure sound yummy (especially if you happen to have a sweet tooth). Some of them are quite unusual for scented candles. A few examples include: zucchini bread biscotti, bear claws, peanut butter brownie crunch, caramel pear, marshmallow cocoa and wedding cake. 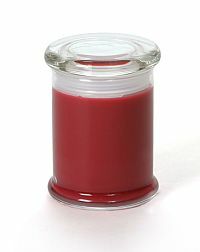 Shown here is a wickless scented container candle in a metro jar. It is a bonus that you don’t have to worry about trimming wicks! If you want to check out more flameless candles, visit Good Stinks.